Nuttiness, bloviations, animals, silence, UFOs, quacks and more! Am I nuts? - Kil needs a new roommate. If atheists left america - A propaganda video that could have been better. Question - Are animals used for testing burn treatments? Editor’s Choice: An intro to Intelligent Design for skeptics - Our lecturer seems to have left. From the Archives: Opinions regarding select UFO sightings - Bngbuck joins SFN to talk UFOs. 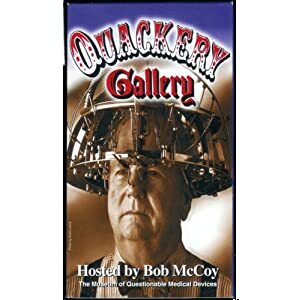 Welcome to the Museum of Questionable Medical Devices: Video Vault and Miracles in the Dark — I’ve been thinking a whole lot about quackery these days after coming across this this old video, which you should also consider a pick for this week. The video is a public service announcement from the FDA. It’s the sort of warning that TV stations used to air back in the fifties and sixties. They don’t do that anymore and I wish they still did. My first pick is a video that comes from the Museum of Questionable Medical Devices in Minneapolis, put together and run by Bob McCoy until May, 2010. What struck me about the video I chose is how little has actually changed since the time that quacks came up with devices like the ones Bob McCoy shows us. Sure, the quacks don’t get to sell radioactive materials to consumers anymore, but they do sell dangerous things, and put people at risk by selling unfounded alternatives to Science Based Medicine. Behold the miracle that only works in the dark. Miracle cures are popping up on the Internet and in unlicensed clinics. They have the veneer of respectable medicine, but they violate the most powerful principle in our medical arsenal: Evidence based medicine. What I will believe and not believe is determined by one simple test: Does it stand up to scrutiny by a third party? Can an outside agency get the same result with objective testing? So there you go. The war against quackery is still raging. I don’t know if we, as skeptics, will ever be able to declare victory against medical quackery, but we have won some battles. We must keep fighting that war because skeptics really are the first line of defense. But the truth is, that when a Library expels a book of mine and leaves an unexpurgated Bible lying around where unprotected youth and age can get hold of it, the deep unconscious irony of it delights me and doesn’t anger me. Wednesday: Talk started with Skepticality host Derek’s birthday. Too many people have health-problems, and a visit to the hospital is too expensive. Kil had a song recorded, other chatters were recorded too. Then we talked about the weather, like tornadoes. And earthquakes. Do earthquakes count as weather? New Age conventions, what can they offer besides a cold reading or a date? Quack! : Tales of Medical Fraud from the Museum of Questionable Medical Devices, by Bob McCoy. There were 8,173 daily visitors this week.